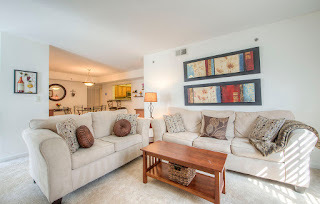 Immaculately maintained 2Bedroom/2Bathroom condo with relaxing sun room that leads to private balcony. 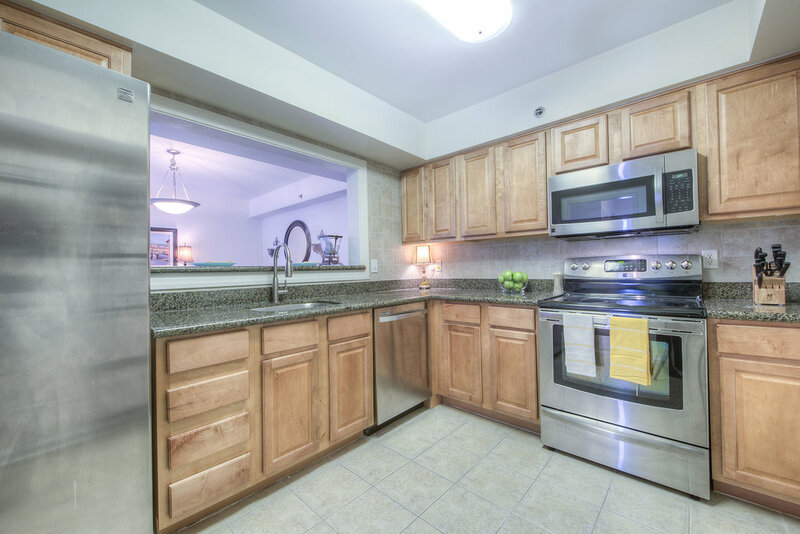 Spacious floor plan features large kitchen with stainless steel appliances, granite countertops in kitchen & vanity tops in both bathrooms. Cozy wood burning fireplace. washer and dryer in unit. Four Winds is doggie friendly, with park on the premises. LOTS of parking! Vienna Metro. Oakton is a great little town that is close to all the major areas of Northern Virginia, without being right in the middle of all the traffic. The Four Winds is situated in an excellent location. 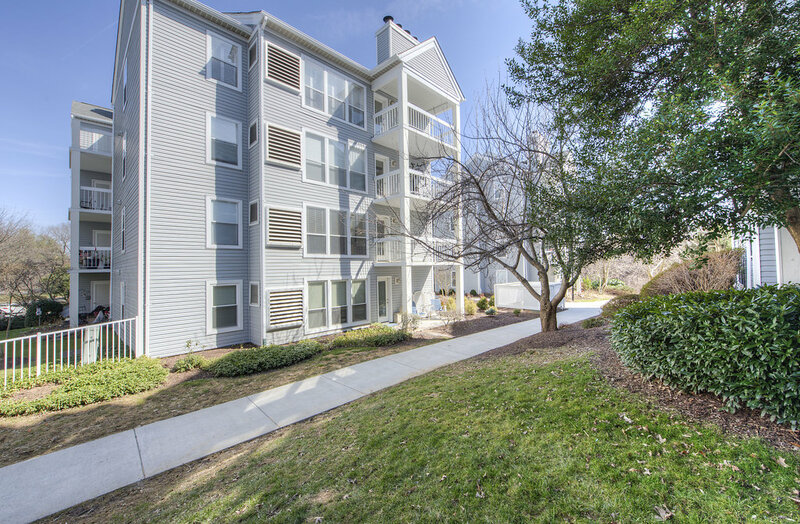 Sitting right next to 66, it is easy to hop on the highway and travel both towards and away from D.C. Tyson's is located just up the road, and the Mosaic District in Merrifield is only 10 minutes away. 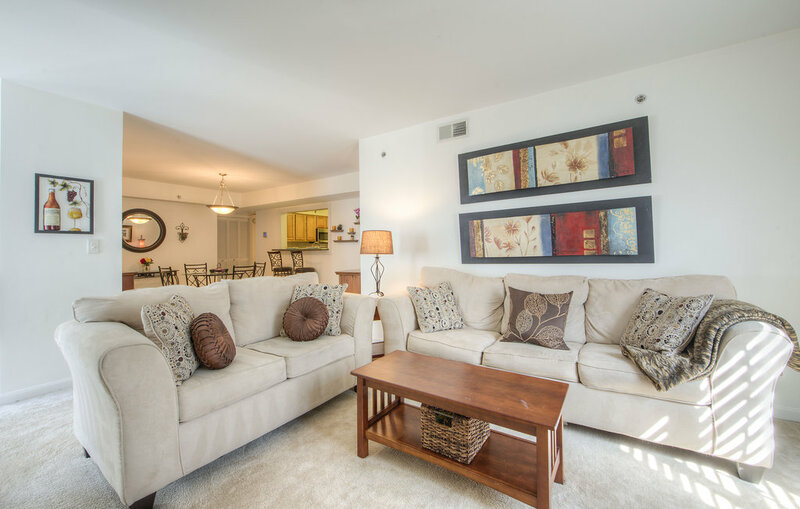 The Vienna metro is located less than 5 minutes away, and it is a convenient way to travel into Arlington or D.C. without the hassle of finding parking for your vehicle. The metro also takes you directly to and from the Reagan National Airport, and in the future the silver line will take you directly to the Dulles Airport as well. Anywhere you need to go, you are perfectly situated to get there with the least amount of traffic when you are in the Oakton area. The Mosaic District is my favorite place to go. In the summer a large farmer's market is set up every Sunday that includes fresh fruits, veggies, and specialty items such as seafood, pasta, and hand-cut meats. The local food vendors offer delicious homemade food, such as sausage sandwiches, crepes, and ice cream made right in front of you. And of course there are plenty of samples to taste and enjoy. I am an avid reader and the Oakton Library is located right around the corner, next to the Giant. I stop by after doing my grocery shopping several times a month. The library website makes it easy to put books on hold so they are ready for pickup when I arrive. There are study rooms, and open tables that are perfect if you need to concentrate and get some work done outside the house. In addition to reading, I love going to the movies. There are several movie theaters in the area at Tyson's, Mosaic District, and Fairfax Corner that are all excellent choices. No matter what you are interested in, there is something to offer for everyone in the Oakton area! The Mosaic District contains a wide variety of restaurants that are all very unique, including True Foods, Cava, and Taylor, as well as gourmet coffee shops such as Dolcezza Artisinal Gelato, Mom & Pop, and Capital Teas Teabar and Boutique. However, I am a huge fan of any type of Asian food, and there are several amazing options right around the corner. BonChon is famous for delicious flash fried chicken that is crispy and juicy. Hot Spot is a hot pot fusion that combines Chinese hot pot, Japanese shabu shabu and Korean flavors in an Asian fondue-style experience. A sauce bar allows you to create your own unique sauces by choosing from dozens of unique flavors. Every time I go I discover something new. Our community is incredibly open and friendly. Neighbors are members of an online group where messages can go out to everyone. If you have a question about anything, including parking regulations, recommendations for contractors, or need to do a carpool, someone will always provide a helpful response. The community and the entire neighborhood as a whole is incredibly dog friendly. At any time of the day you can see someone walking their dog around. In the back of the community there is a dog park, where your dog is able to run off leash. Around the corner is a playground where many people take their children to play during the warm months. The playground is less than a 5 minute walk from my front door and I often walk around the area with my dog. There is even a "dog swim" at the end of the summer where dogs are allowed to swim in the pool in the last few hours before it is closed for the winter. In addition, as a fitness-buff, I love the gym that is within the community. It is great for an early morning cardio session or for a time that I just don't want to travel to the Gold's Gym. The equipment is well maintained and the facility has a great vibe. As soon as I saw the buildings at The Four Winds, I was immediately reminded of Key West, Florida. There is such a fun laid back feel that is especially apparent in the warm summer months. This unit is the most spacious of all the unit types in the community, and it definitely feels spacious. The extra bonus office/den is an amazing space and convinced me that this condo was the one for me. Since the condo is on the top floor, I appreciated the fact that there is an elevator that I can use when I am carrying up heavy groceries or anything else that would have been a struggle using the stairs. The landscaping around the buildings is very well maintained and makes the whole area look better. And of course the pool is an excellent addition that is open all summer long. My unit is located in one of the most desirable locations in the building. As a top floor corner unit, I don't have to worry about noise from any upstairs neighbors, and my unit only shares one wall with the neighboring unit, so noises from neighboring units are virtually unnoticeable. The condo has an incredible number of windows that let in a ton of light. The windows have custom made plantation shutters that can be opened fully to let in more light. During the morning hours, light comes in to the living room, and during the afternoon it lights up the office area. The office has a wall of windows and gets very bright and sunny in the afternoon. It is a great room to relax in after work and read a book. The kitchen has excellent granite countertops and stainless steel appliances, and there is plenty of space on the countertops for all of my food prep needs. However, my favorite feature of this condo is the master bathroom. Renovated in 2014, it features a large deep jacuzzi tub with 10 adjustable jets. The tile gives the whole area an oasis feel, and the built in two shelf niche is perfect to hold all my shampoo and shower necessities.